If all goes well, I think I will complete the new Santa cross stitch design today....yippee!!! Pictures of this to follow (hopefully in a day or so)...still have to come up with a pattern title for this guy! After 21 years of being in this business I find it harder and harder to come up with pattern titles...always afraid I'm going to repeat myself! 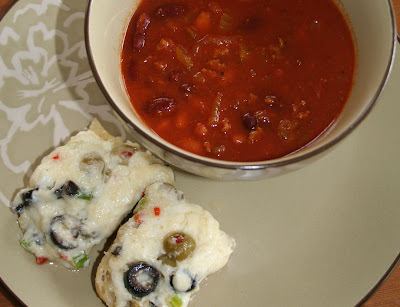 Sharing a couple of recipes today...enjoy!
" A great chili with just the right amount of spices. Good served with a slice of Cheesy Olive Ciabatta bread or buttered Saltine crackers (my personal favorite)." Place ground beef in large skillet; cook over medium heat until browned. Drain & set aside. Add all other ingredients and bring almost to a boil and then reduce heat. Simmer on low heat for 1 1/2 hours; stirring occasionally. Mix first 6 ingredients in a bowl. Slice bread in half width-wise & lengthwise. Place on a baking sheet. Spread cheese mixture over bread. Bake at 350 degrees for 15 - 20 minutes or until cheese is melted. Cut into serving pieces with an electric knife.